I see him abruptly leave our surfing lesson in between and pace towards the seashore. He picks up a diaper lying on the beach before it can be swept by the waves and throws the same into a trash bag. Juan is one of the co-founders of Kallialay Surf School located at Serenity beach, Pondicherry. Kallialay was a chance discovery. I stumbled upon it during my solo backpacking trip to Pondicherry. Being an impromptu plan, I was totally unaware of the existence of good surfing schools in India. But as luck would have it, I overheard the interesting story of Juan and Samai (co-founders of Kallialay Surf School) from some strangers at a restaurant and decided to give surfing a go. The following passage presents my recollections from one of the best moments I have ever had in my life. I was at this 4 day session called ‘Moral Rearmament programme’ conducted by ‘Initiatives of Change’ at Asia Plateau, Panchgani, Maharashtra. Read this if you believe in the power of listening to your inner self. We all lead a hectic life. From daily classes to never-ending deadlines, it is extremely easy to get lost in this fast paced world. Every day, we struggle with challenges that lie both outside and inside ourselves. But with time, we lose our inherent capability to fight these challenges while trying to keep up with the world around us. The moral re-armament programme conducted by ‘Initiatives of Change’ (IofC) was a welcome change from the rat-race that we are all a part of. It is conducted at a beautiful location called Asia Plateau –Panchgani. To describe the experience in one sentence- it provided us with an opportunity to connect with our inner self and experience the power of silence. Our first day started with waking up early and catching the 6 am bus from our college campus that would take us to Panchgani. After an exciting morning ride, we all reached the Asia Plateau campus within three hours from departure. The first glimpse of cloud covered campus made us rejoice with happiness. We have seen plenty of cloud cover days here at Lavale, but this was different, it was as if the weather had a personality of its own! We were all waiting for the sessions to start. The land whose exotic rain-forests hide one of the most beautiful secrets of India- the ancient Living Root Bridges. These Living Root Bridges, as the name suggests, are bridge like structures made from the roots of Fiscus Elastica. Interacting with locals, we found out that each living root bridge take at least about 10-15 years to become sturdy enough to hold human weight, and most of the living root bridges in the Khasi-Jaintia hills of Meghalaya are over 100 years old. In this article, we’ll showcase a series of such bridges encountered by the author during his trek to a village called Nongriat near Cherrapunjee. The trek starts about 3-4 kilometres from Nongriat, a village famous for its rare Double-Decker living root bridge. Enroute the Nongriat Trek- Such views are abundant. Ticket Cost for Single Decker Root Bridge: 10 INR. Ever been compelled to watch a horror movie in the dead of night even though you know it would lead to countless sleepless nights? Ever been infatuated with the idea of exploring a haunted house? No? Yes? I was. So were four of my friends. The big question was – where? Residing in Delhi which has seen its share of cold-blooded assassinations, bloody battles and betrayals, we thought it would be easy to spot restless, revengeful souls here. After making trips to the Khooni Darwaza, the Malcha Mahal, Agrasen ki Baoli and even a neighbouring house in the residential area of Lajpat Nagar, and not meeting any ‘other worldly’ (just because it is an accepted term, if they are in this world, how are they other-worldly? Anyway more on that later) creatures, we couldn’t decide where would our efforts find fruition. We finally zeroed down upon Bhangarh. What better place to get the thrills than a ruined city which is famed to be India’s most haunted place? On the D-day, we rose early and started preparing ourselves according to the lengthy to-do list put together by our friend. She insisted that the place was infested with djinns who cling to open hair – which made all of us pull our hair into tight buns. Applying perfume or fragrant shampoo was a definite invitation for ghosts – hence, avoided. We had breakfast with an uneasy sense of foreboding and then drove away. Throughout the 60-odd km drive to the destination form Jaipur, we were excited and discussing details with our jolly driver – Param bhaiya (In India men are ‘bhaiya’ until they become ‘uncle’ at about the age of fifty or so. It is the polite way of addressing them). It was a bright December morning. As the majestic ruins loomed towards our eyes, the Sun warmed our souls and we walked on towards the fort from our car. And I thought, would it be just as beautiful had it not been chaotic? If this is its state in abandonment, how did it look at the peak of prosperity? Immersed in thoughts, we came upon a notice by the Archaeological Survey of India, prohibiting anyone from staying inside before sunrise and after sunset. After reading this proclamation of the dangers inside, we ventured onwards into the realm of ghosts. Disclaimer : You will feel very hungry. And you will need to travel. Lovely Omelette Centre is considered to be one of the best omelette experiences in India. Extensively covered by all the leading travel/food journals of India (Lonely Planet, Outlook Traveller, Trip Advisor, Highway on my Plate), this Omelette paradise is adored by all. It offers a limited variety of omelettes (Oil/Butter/Cheese being the prominent ones). Location: At the Picture Palace end of the Mussorie Mall (Uttarakhand), near the Church. Location : Malabar Chips, Thekkady. There is lots on offer here – sweet, salty, tangy banana chips and several kinds of other specialities like tapioca chips. I don’t remember my childhood. 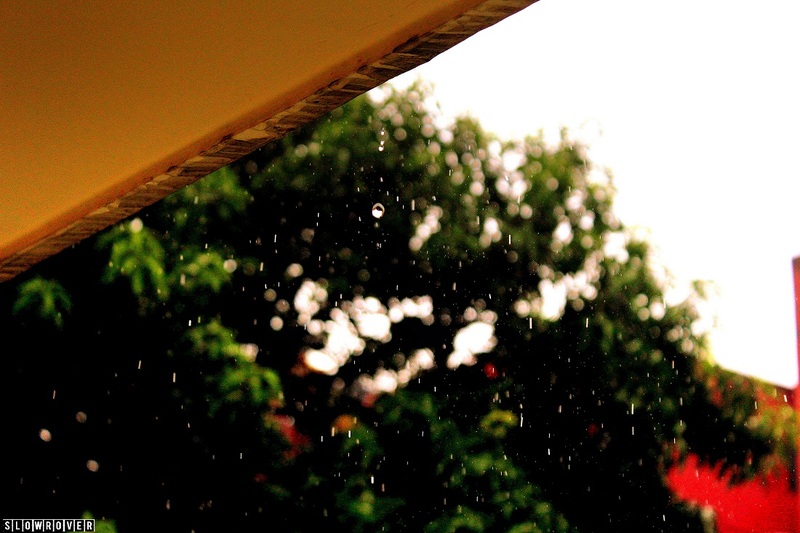 Nothing except the smell of the monsoon rains, right before they lashed onto the verandah. Me, the solitary crawler, both enchanted and perplexed by a sudden downpour, would rush indoors to the safety of my mother’s lap. Such memories are vague, rather loosely etched on my mind. But the smell of the rains, the Petrichor, is something I can never forget. I suspect that the ravishingly beautiful Petrichor is hard-coded deep into the minds of every human being. It is passed onto an individual through an infinite chain of forefathers. Or maybe it is simply a gift from heaven. After all that’s where the rains come from! I cannot think of any other place in India that celebrates the Hindu festival of Vijayadashmi (Dussehra/Dasera) with such zeal and grandeur. The celebrations last for the entire duration of the holy Nine-Nights (Navratri) and is marked by the famous ‘Jumboo Savari’ or the Dasera procession at the iconic Mysore Palace. YES, I attended this festivals for catching a glimpse of these Majestic Elephants (lovingly called as Appus!) and NO, I was not disappointed! Appus have a knack of cheering you up! SR Travel Tip: Mysuru is famous for its grand palace that is lit up by TEN THOUSAND light bulbs during the Navratri celebrations! You cannot afford to miss the sight of this palace if you’re in Mysuru during Navratis! Additional Readings: There is much more to the Mysuru Dasera Parade than what the article captures. Read this and this if you are interested to know more about this 400 years old tradition. Beyond the bustling lanes of Mehrauli, in the domineering shadows of the Qutab Minar, lies a oft forgotten gem known as Mehrauli Archaeological Park. Despite being widly covered by the plethora of the Indian travel bloggers, it still remains way from the eyes of the usual tourist. The tomb of Jamali Kamali is arguably the most famous (and supposedly haunted) structure of this 20o acre park. Some say that the two tombs at the Jamali Kamali Mosque are of a gay couple called Jamali and Kamali, while other sources rubbishes the claims and address them as husband and wife. While the scholars are busy trying to refute such scandalous rumours, I couldn’t help but get enchanted by the intricate colourful engravings on the inner walls of this Tomb. Whatever the truth, Jamali Kamali did leave behind a colourful legacy. SR Travel Tip: The Mehrauli archaeological park also hosts other historical marvels such as Balban’s Tomb, Rajon Ki Baoli, and Metcalfe’s follies. A weekend sojourn to this hidden gem of Delhi is highly recommended. You’ll rarely find its mention in any Meghalaya itinerary found online or in travel guides. Neither will the locals persuade you to give this hidden gem a visit. But find it, you must! This Bamboo Skywalk is located in beautiful Meghalayan village called Nohwet, at a distance of about 80 kilometres from Meghalaya’s capital city-Shillong. Sadly, this village is often skipped by tourists who prefer the proximate (and more famous) village of Mawlynnong (Too mainstream, I tell you!). Each year, two brothers build a bamboo skywalk/view point, more than five stories above the ground, with their bare hands. For a nominal fee of 20 INR you can, from atop this skywalk, witness the true consequences of the world’s most profound monsoon (this is the wettest region in the world! )- a 180 degree view of numerous waterfalls, more than you can bother to count, and the mirror-like the flooded plains of Bangladesh. Want to see more of Meghalaya? Click here and here to access more images from this beautiful state. SR Travel Tip: If you ever get a chance to visit the godly Indian state of Meghalaya, keep a day exclusively for Nongriat Village– home to the double decker living root bridge of Meghalaya! Click on the hyperlinks to access more amazing content from us. You need to traverse a total of 365 stairs to reach the Monkey Temple of Kathmandu- ‘The Swayambhunath’. The climb is steep, often disclosing an impossible to climb gradient of ascent. But once you reach the top, it is a sight to behold. The entire city of Kathmandu is in front of you, showcasing its sea-like expanse against the background of the mighty Himalayas. Despite being a Hindu temple, the temple complex is usually maintained and frequented by Buddhist monks who perform their traditional rituals daily. The ceremonies are not only elaborately orchestrated, but also colorful. SR Travel Tip: Another must visit place in Nepal is the town of Pokhara. Located beside the beautiful Phewa lake, Pokhara boasts of magnificent landscapes and exotic eateries. Want to see/know more about Nepal? Click here! PS- Click on the hyperlinks to discover exciting secret content! Let us know which one you liked best! Happy browsing! Beauty, it is said, lies in the eyes of the beholder. All things are beautiful, however, it is us who should be able to see the magic within. Ross Island is a perfect example of this apparent subjectivity. An island, which was once the seat of the mighty British Empire, now lies in ruin. But they say the ruins have an ability to speak to your soul; to fondle the emptiness within. And Ross Island does just that. The island, deserted decades ago, is now full of dilapidated structures reminiscent of the glorious past. However, if you look close enough, you’ll manage to find beauty in this negative place. Want to see/know more about Ross Island? Click here! SR Travel Tip: Andaman is a treasure trove of travel escapades. We highly recommend an sunset dip in the most beautiful beaches of all – The Radha Nagar Beach of Havelock Island. Cozily perched in the lap of one of the most beautiful valleys of nature, the Dal Lake possesses the wizardry to enchant even the most reluctant tourists. The ‘Shikaras‘, or the small boats, that ply across this calm body of water are considered the highlight of this region. A sight of a distant, yet visibly colourful, shikara with its reflection etching the mirror-like surface of the Dal lake, and the hues of setting sun being reflected in the background. It seems that the term ‘Heavenly‘ was coined exclusively for such experiences. SR Travel Tip: If you get a chance to visit the Kashmir region of India, make sure you try the renowned ‘Wazwan‘ multi-course meal of Kashmir. Being a foodie myself, I can vouch for ‘Wazwan’ being one of the best food experience in India. Want to know more about Kashmir, India? Also, if you liked this post, you’d love this page as well. Click to check it out!